I mean, I’m scraping-at-the-bottom-depths-of-the-center-of-the-earth tired. You see, for autism moms, “tired” encompasses a whole lot more than feeling like you need to sleep. It’s a never-ending stint in exhaustion. Full-body, full-emotion, full-soul exhaustion. It can affect every fiber of our being. To be an autism mom means to be on call 24/7/365. Kids with autism need more from their parents. To be an autism mom means a lot of calls, emails, and notes home from school to field and troubleshoot. To be an autism mom means hours upon hours of school meetings, often as the one and only person truly looking out for your child’s best interests in a room full of opponents — like playing tug of war and everyone is on the other side of the rope, except you. To be an autism mom means laying in bed at night, every night, worrying about your child’s future. 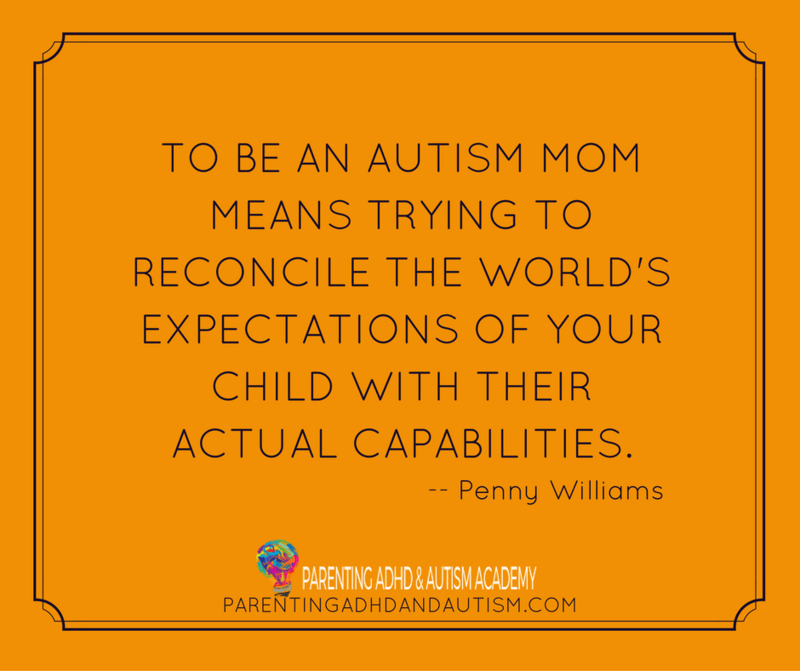 To be an autism mom means trying to reconcile the world’s expectations of your child with their actual capabilities. To be an autism mom means accepting a never-ending quest, a burning compulsion, to find that thing that might make life a little easier for your child. To be an autism mom means often feeling overwhelmed with sadness that your child is burdened with these struggles. To be an autism mom is to live every moment under tactical alert, waiting for the next emergency, waiting for the next shoe (in a never-ending supply of shoes) to drop. To be an autism mom is to work hard and diligently to craft moments of joy, success, and celebration. To be an autism mom is to truly love unconditionally, with your whole heart and the whole of your being. Are there good times in life parenting a child with autism? Of course! Ab-so-friggin-loutely! There’s lots of joy in raising a child with autism… but there’s also a never-ending, underlying exhaustion. An exhaustion few people know, unless they’re an autism mom, too. Yes to everything you wrote! I am so tired and most people cannot understand. Thank you for writing this. Yes! Exactly. I liken it to the chronic fatigue I live with due to fibromyalgia. It IS exhausting being an autism mom/grandma and the worst part is when you are so utterly tired…and you lay down only to be met with insomnia. Thank you for sharing with everyone that has no idea. Wow so true! Thankful to have an amazing hubby and sure this is true for an autism dad too! I think there’s a higher chance to develop your own anxiety and depression in an unpredictable environment with “waiting for the other shoe to drop.” Feeling like you did the wrong thing or made a wrong choice when the shoe does drop. Grief that you cannot make everything better or save your children. All of those feelings can come with being a tired autism mom. Absolutely! This special parenthood definitely impacts our emotional and mental health.